Sumter County, Florida, February 17, 2017	(Newswire.com) - ​​The Davis/Stephens family has owned the 16,000 acre Ventura Ranch property for over 40 years. It is among the largest land holdings in Florida which prizes a land management program that has both restored and preserved native Florida habitat and wildlife. The diversity of habitat including improved pasture, Florida flatwoods with wiregrass understory, varieties of planted pine, rolling terrain, wetlands and natural springs, are truly magnificent. Its multi-generational ownership has labored to incorporate sustainable agricultural uses throughout the property. In March of last year, Sabal Trail Transmission, LLC (“Sabal Trail”), a joint venture of Spectra Energy Corp. and NextEra Energy, Inc., filed eminent domain proceedings in federal court to acquire a five-mile long corridor, 100 feet in width, diagonally through the heart of the Ventura Ranch property. 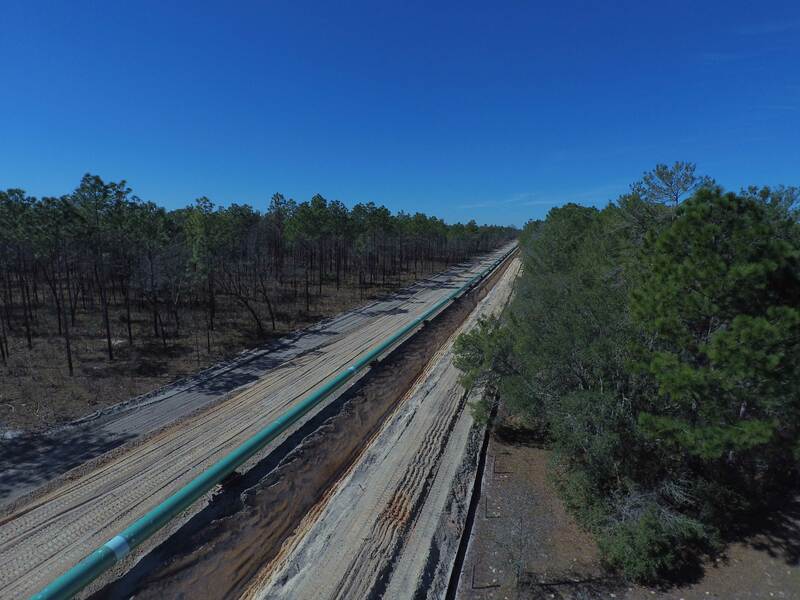 Sabal Trail is in the middle of constructing its 240 miles of 36-inch-diameter pipe running through Florida in order to transport 1 billion cubic feet a day of natural gas at extremely high pressure. The federal court has granted Sabal Trail “immediate possession” wherein the company is able to proceed with the construction of its pipeline without interruption and later pay property owners the just or full compensation for the taking of “easements.” An “easement” allows the easement holder to put property to use for a particular purpose, reserving to the underlying property owner rights that are not inconsistent with the easement holder’s use. In essence, the underlying property owners’ rights become subservient to the easement holder’s rights. One may ask, “What does that look like?” Well, for Ventura Ranch, one of the chief concerns of any large landowner is how to secure a property of its size from uninvited guests. The risks associated with liability for people and property loom large when uninvited guests roam around a large property doing uninvited things. Fire, too, is a significant threat. Ventura Ranch expends tremendous resources in implementing a fire-control burn program throughout all of its habitat and hunting preserves. However, a fire which breaks out in an uncontrolled manner can wreak devastation to substantial acreage in a short amount of time. This past Sunday evening, Scott Stephens, a family member who lives and works on the Ventura Ranch property, decided to show his wife and young children where Sabal Trail was constructing its pipeline on the Ventura Ranch property. 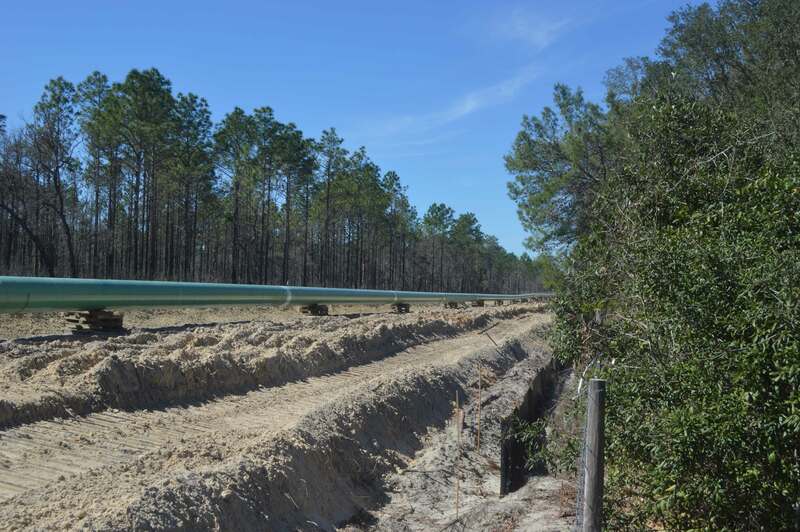 He wanted them to see the massive pipeline works before Sabal Trail placed all of it in the imposing trench next to the place where the pipe was being welded together. Sabal Trail had already stripped and cleared a 100-foot wide swath of forested area to have sufficient room for its construction activities. It would be something to mark in the family history associated with the ranch, the day that the pipeline first came through the land. 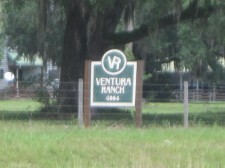 Driving up to the north end of his property, Stephens found that Sabal Trail had two security guards posted at the north gate of the Ventura Ranch property. The two guards were professional and courteous to the Stephens family, but Stephens grew suspicious toward the end of their visit when observing a “new” Sabal Trail security guard arrive to take over the night’s watch. This new guard drove up in a flat-bed truck with a bar-b-q cooker in tow. Stephens drove back to his home, put his children to bed, and then returned with another Ventura Ranch employee at about 9:45 p.m. to see if there was anything amiss at the north gate. Stephens is an avid hunter, works year-round to preserve the habitat and wildlife throughout the ranch property, and is probably the family member with the most sensitivity to the risks of what uninvited guests can do when having access to land which in most instances is excluded from public use because it’s private property. What Stephens saw even amazed him. The Sabal Trail security guard had fired up his bar-b-q and had invited as many as four other people to join him for a Sunday night party. Alcoholic beverages were also provided. At about 10:30 p.m., Stephens decided to confront the guard and his party-going friends, taking photographs of each of their driver’s licenses. One of the party-goers was underage. Outraged, Stephens called the project manager for Sabal Trail to report the incident. While apologizing, Sabal Trail has since informed Ventura Ranch that it had fired the offending security guard and would now be only retaining the services of off-duty Florida Highway Patrol and Florida Fish and Wildlife Officers to provide security services to Sabal Trail. What is underscored from such an incident is how private property owners whose land is taken under eminent domain and then made subject to an “easement” are at the mercy of Sabal Trail with respect to how the pipeline company puts to use the property. Ventura Ranch is not able to exclude those who Sabal Trail authorizes to be on the easement property neither is Ventura Ranch able to screen or require Sabal Trail to only employ responsible vendors whose employees meet certain baseline qualifications. It is always hit or miss. If something goes awry, it’s only an apology that follows. In fact, the very people who are hired to patrol and keep out uninvited guests are the ones who host the party. Sabal Trail contends that if their pipeline is buried, no one will ever know it’s really there on the property. Those who have had their properties cut through the middle with a pipeline easement know better. It’s the pipe and everything that comes with it, including the loss of being able to exclude others. It’s these other folks who introduce a whole other kind of potential risk to property owners who would rather be left alone.